A luxuriously crafted Tolkowsky I P1 brilliant cushion cut diamond set on a beautiful 18ct white gold ring with a halo of diamonds and sparkling diamond encrusted shoulders. The centre diamond is crafted using the innovative Tolkowsky formula in order to produce the finest brilliance, fire and scintillation, totalling 1.50ct. 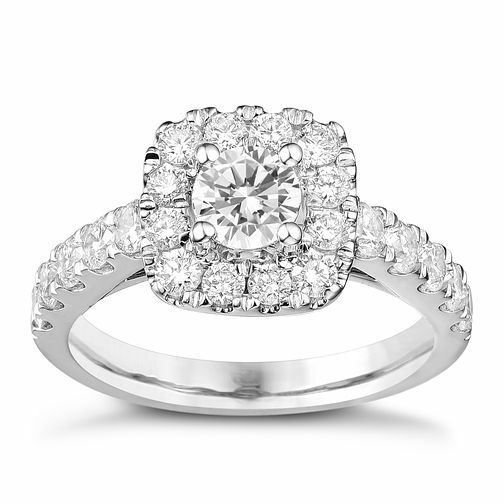 Tolkowsky 18ct White Gold 1.50ct Cushion Diamond Halo Ring is rated 5.0 out of 5 by 1. Rated 5 out of 5 by Anonymous from Engagement Ring Amazing service from manager Liz at Braehead such a lovely Lovely way with her, fantastic customer service and knows her tolkowsky inside out, would highly recommend. I have had different brands in the past but this ring is by far the most amazing, so many compliments. Could not be happier with this purchase.